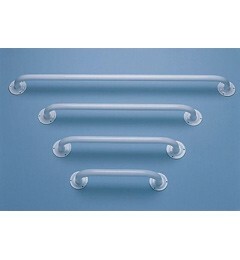 White powder coated steel grab rail ideal for any bathroom. Pre-drilled fixing holes in flanges. Available in 12", 18", 24" and 36" versions to suit a wide range of purposes and rooms. Every rail features 2.5 cm / 1” diameter steel tubing.